Each year, Mount Olympus Awards sells tens of thousands of custom chenilles. Among our most popular products is the classic, traditional varsity letter. We thought it would be interesting to provide a history of the varsity letter - how it came into existence and why it remains so popular today. According to editor Jamie Richardson and researcher Jim Richardson at the Leather Sleeves newsletter, "It seems with the advent of organized sports, there was a need for uniforms. There was an additional need for identifications which was satisfying by the use of emblems or letters. In 1865, the Harvard baseball team added an old English 'H'. The 'H' was embroidered on the gray flannel shirt. The football team started to use the 'H' in 1875. It is interesting to note that for 25 years following the introduction in 1865 of the letter, it was the practice for the team captain to allow certain players who played in the most important games (Yale or Princeton) to keep the 'H' jerseys as an award. If a player did not play in an important game, the player had to return the jersey at the end of the season. Awarding the 'H' jersey may have been the birth of the varsity letter as an award. The letterman sweater was first regularly used by the 1891 "Nine" (baseball) and was black with a small Crimson 'H' on the left breast. It is not known when the letterman sweater came to high schools. The earliest example that VLAS has come across is in the 1911 yearbook of Phoenix Union High School, Arizona Territory. Pictured, not in football uniform, wearing a V-net sweater with the letter 'P' on the left side is a student in a group photo." Today, the varsity letter remains as popular as ever. Whether you choose to wear your varsity letter on a letterman jacket or sweater, you can choose a font, color, size, and design that fits your personality. To learn how to order your custom letterman jacket, read our free tutorial. 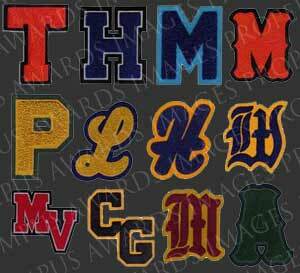 To get started designing your own product, visit our custom varsity letter category. Are you a coach, athletic director, principal, teacher, or advisor who wants to save money on letterman jackets, varsity letters, award letters, sports patches, activity pins, and more? Now is your chance! Take advantage of the MOA Team Supply summer sale, with discounts of up to 25% off our already industry-beating prices!